Tim Howar in "The Phantom of the Opera"
Tim Howar has been rocking out on the London stage of late in Rock of Ages and Chess, and the Canadian performer is now donning that legendary mask to play—you guessed it—The Phantom of the Opera in the ongoing original production of the Andrew Lloyd Webber musical at Her Majesty’s Theatre. Broadway.com chatted to the ever-likable performer to discuss career surprises and keeping that famous mask away from his infant son. Welcome to such an iconic role! Does this feel like a date with destiny? It’s just a gorgeous job that I never in a million years thought was going to come my way. It feels like a dream, really, to be part of something so everlasting: Phantom is just one of those things that has entered the culture, and I really do believe that Andrew Lloyd Webber is one of the most remarkable writers of our century. What was your original exposure to this musical? My Phantom experience started in Toronto. I was a huge fan of Colm Wilkinson, who was playing the Phantom at the time, and I remember seeing it four times and thinking he was just sensational; vocally, he was at the height of his career, and I wanted to see what he was doing. Did you then begin to eye the title role for yourself? I thought at the time that maybe I would play Raoul if I was lucky, but I never thought I would play the Phantom. I came upon the show again when I was in L.A. doing Les Miz and Davis Gaines was there playing the Phantom, and I thought he was great. I then moved to the U.K. and was reintroduced [to this musical] all over again. Didn’t you have an unusual connection to the West End production, at least to start with? Yes, I was living here with Ruthie [Henshall, his first wife] and we were expecting a baby and our show Peggy Sue Got Married had closed as a result of 9/11. I had no money, nothing. So, I went to work in the ticket agency for the Really Useful Theatre at the time, which was also when my good friend John Owen Jones was playing the Phantom and blowing the roof off the place. Was that when you earmarked the role? Never: I just thought I’d be the guy selling the tickets. What happened was that someone from the producer’s office must have come and seen Chess [in which Howar starred this past spring opposite Michael Ball at the Coliseum] because I was asked if I would come and sing for the Phantom. I thought it was a long shot, but I went into this little rehearsal space and sang “The Music of the Night.” They said we want to see you again and then a third time, so I was put on tape so that [the audition] could be sent to Andrew, who was away at the time. I then got word back that Andrew loves your stuff but wants to see you live—and here I am. How does it feel to inhabit the production from the inside? What’s so extraordinary is the way they treat Phantom here with such care and attention. They’re constantly investing in upgrades to the theater and to the production, and our sound now resembles what you might find in a Hollywood blockbuster. They’ve also still got a 27-piece orchestra doing it: Phantom is a large show and they’ve kept it that way. Do you feel as if you’re part of an illustrious roll call of Phantoms? Ramin [Karimloo, a former Phantom] and I have been really great mates for years and years and we hang out and he was like, “Dude, just get used to sweating a lot.” I saw Norm Lewis when he was over here doing Javert, and I’ve got Ben Lewis nearby, too. I just love that I’m still included in this little theatrical group. Are you surprised, as some Phantoms have been, by how comparatively little stage time the character actually has? He has much more to do in the sequel, Love Never Dies. I’ve had people say to me, “It’s 27 minutes, how can it be that hard,” but it’s 27 concentrated minutes. Actually, I think it’s got to be more like 40 minutes because of those moments where you’re waiting, and the intensity you have to have when you enter the stage is huge. It’s like starting a race somewhere in the middle: you’ve got to be 100% there. 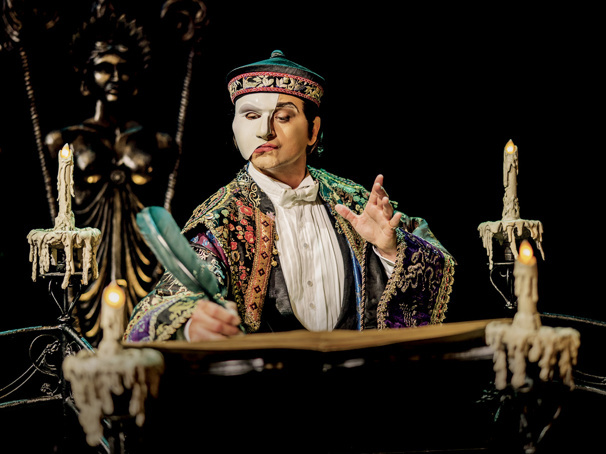 How are you taking to the daily rigor of applying the Phantom’s mask? I’ve never been more glued in my life! I smell like a lovely coconut when I come out of the show, and my skin has never been better. I haven’t shown Hamish my mask. I think it could be a little bit traumatic; I haven’t even shown my dog [laughs]! The prosthetics for this show have evolved over the years and it now really does look grotesque, so I think I better hold off on sharing it with the family. I’m so lucky to be hanging out with Mike Rutherford, who created Genesis with Phil Collins and Peter Gabriel; it’s not every day you get to hang out with these guys. I think the rock and roll thing has been really healthy for my career as an actor. It’s interesting that Phantom was originally written for Steve Harley, who was the frontman for a band called Cockney Rebel and then Michael Crawford fought for the role and got it. So, you’re returning the show to its musical origins? Andrew’s dream always was to have a guy from a rock perspective come in and give it that little bit of an edge. Do you ever think of doing a non-musical part, as Ruthie, for instance, did in 2011 with Blithe Spirit? You bet! I grew up seeing theater and knowing about Beckett and certainly Shakespeare and Shaw and Ibsen long before I knew musical theater existed—and cutting-edge theater too, like [French-Canadian writer] Michel Tremblay: that’s what I thought actors did. As long as I’m onstage telling a story, that’s what I want to do. Storytelling is the most important thing.